Being a trade customer with Smiths Hire brings with it a whole host of benefits. From reduced hire rates and specially tailored account pricing to a dedicated point of contact for your business, a Smiths Hire Trade Card is the best solution for businesses around the North West. Join the 1,000’s of customers benefiting from having a Smiths Hire Trade Card. 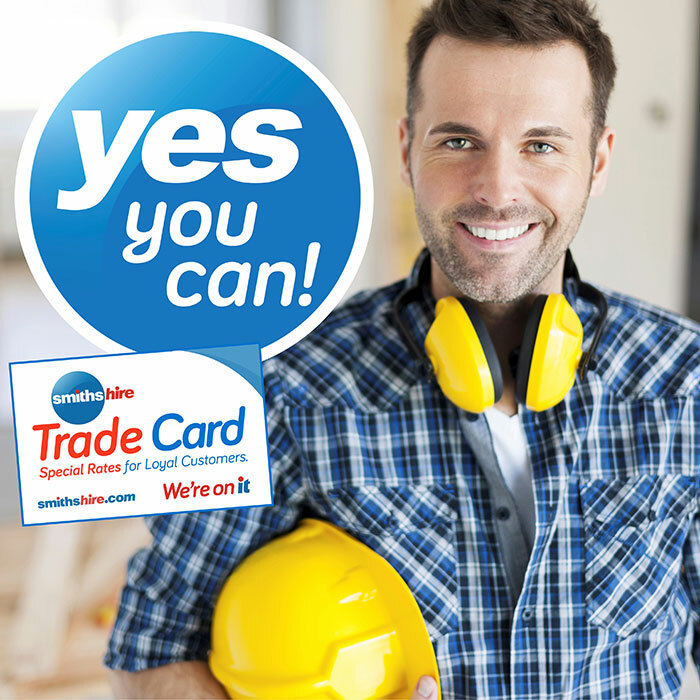 Your Trade Card entitles you to more than just Discounted Hire rates with a trusted equipment hire company. We’ll even tailor your customer experience to your needs, ensuring you always receive unbeatable service, the right tool for the job including Guaranteed Next Day Delivery across our the top 50 fleet hires. Even lower long-term hire rates. Tailored pricing depending on spend. Account customers get up to 30 days free credit. Up to 25% discount on all retail products. Monthly ‘New’ product updates sent to your inbox. Dedicated Hire Desk Controller as your point of contact. 12 Hire it Centres throughout the North West. Free Guides: for Access equipment, Plant Site Works and Tool Hire. Special Rates for Health & Safety Training – IPAF, PASMA and First Aid. Signing up for a trade card is easy! Simply visit your local Hire it Centre and we will negotiate our special rates with you. Once agreed, the card will be sent to you in the post and your discounts and other benefits will be available immediately across our entire depot network. Interested in becoming a Smiths Hire trade customer? Get in touch to find out about how a Smiths Hire trade card could benefit your business.